QUOTE: "I had a wife once, and a son. Same as you. I loved them very much." Born around the turn of the 20th century, Daniel Ogburn was a good man who found love and contentment from his family. 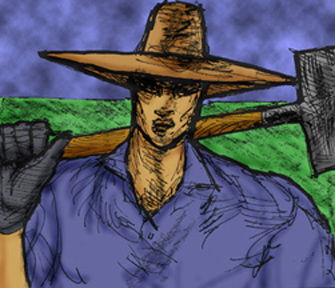 He made a modest living as the small town's only gravedigger. Daniel also farmed his land to keep food on his family's table. Life was as normal and mundane as ever... until the town's new mortician, Mr. Moriart, arrived. After Daniel discovered Mr. Moriart's dark secret, the Ogburn family was murdered. During the course of the tragedy that took the lives of his wife and son (and nearly his own), Daniel Ogburn changed. Though he could not understand how, Daniel had gained supernatural abilities. Not completely a zombie, Daniel had recovered enough of his humanity (emotion, intellect, etc) that he became something new altogether. His body had become tougher, and no longer reacted to pain. He could see at night nearly as well as he could in the daylight. He found he could know the nature of a man's soul just by looking into his eyes. He could also 'feel' when evil souls were around him, and he was compelled to seek out these souls... and destroy the men to whom they belonged. Daniel died nearly 70 years ago. The husk left behind goes by the name Ogburn, and still holds onto the memories of the family lost long ago. Ogburn travels from city to city, cleaning up some of the human trash he encounters. Like other Guardians, Ogburn will try to extinguish any evil that crosses his path, but he has a particular disdain for full-fledged zombies... and whoever creates them.